So, why write yet another article on container vegetable gardening? Yes, there are great websites out there with great information on this subject. However, our vegetable gardening sites mission is to help the beginner gardening enthusiast avoid most of the common mistakes they will encounter planting their first vegetable garden. And, in the case of this vegetable gardening article, we'll take a look at how to avoid common container vegetable gardening mistakes. For the beginner gardener who has a back yard and has been thinking about growing a few vegetables for the first time, but not really interested in a lot of vegetable gardening work, container vegetable gardening might be just right for you. Oh yes! I'm not going to leave out the beginner gardener who would love to grow a few vegetables but believe they can't because they don't have a garden. Sometimes vegetable gardeners who have a home just assume everyone has a little garden plot outside their door. Unfortunately, the luxury of a little garden plot is not a reality for most apartment dwellers. But you still can grow vegetables even if you live in an apartment. There are times before we plan on doing something, we need to have a good reason before we do it. And, in this case, why would container vegetable gardening be something one would want to do? You wouldn't if you're not the least bit interested in container vegetable gardening. But we both know you are, else you would not be visiting this particular page on our website. or apartment dweller to consider when thinking about container vegetable gardening. To begin, it's inexpensive and few tools if any are required. There is no digging or tilling or fighting with garden weeds that seem to pop up magically every time you turn your back. It's a great method of vegetable gardening for people with physical limitations. For apartment dwellers, you can garden when it is raining and not have to worry about getting wet or track muddy foot prints into your home. Home owners can enjoy this same advantage by placing your garden container under an awning or covered patio. Container vegetable gardening is not time consuming. You can water ten containers in ten minutes. Container vegetable gardening takes up very little space. There are little if any vegetable garden pests problems. If there isn't sufficient sunlight entering your home or apartment, you can substitute by using artificial lights. However, there are a few vegetable plants such as tomatoes that will not grow and produce fruit under artificial light. If you can place your garden container outside, they can be be moved about in your backyard, patio, or other location to receive direct sunlight. You don't have to be that fussy when choosing a container or pot for your vegetables. But there are a few things you should keep in mind before you buy. Size does matter when it comes to growing certain vegetables that have a root system that requires space to breathe and spread out. We'll talk about that a little later. Here are some things to keep in mind when choosing a pot or container. If you are artistically inclined, please feel free to experiment. But do remember the following when you make your purchase. Make sure there is a hole in the bottom of the container so that excess water can drain out after you water your plants. Dark color container or pot will attract more heat than a light color one, and this will cause the soil in the container to increase in temperature causing excessive water evaporation and add extra stress to your plants. The same also holds true for any metal container pot. Porous pots are very popular and if this is your pot of choice, keep in mind this type of pot will lose moisture much faster than plastic pots and you will have to water your plants more frequently to keep them healthy. If you buy a plastic container or pot, avoid purchasing those that will become brittle and crack due to long hours in direct sunlight. Most gardening centers carry a line of plastic pots and containers that are sun resistance. Avoid wood containers that have been treated with a chemical. Yes, I know some of these can be really decorative. However, any treated lumber will cause chemical leaching into the soil and will be absorbed by your plants. The idea with planting your own vegetables is to eat healthy foods, not toxic foods. A general rule of thumb for vegetable container pot size is "the bigger the better." 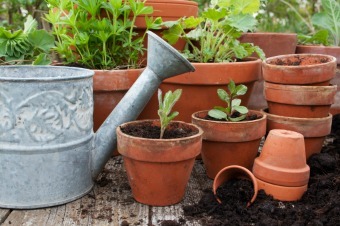 Know your vegetable plants requirements before you buy a pot. Some vegetable plants develop a large root system and need a pot size large enough to accommodate their growth. If the container pot is too small, the plants roots cannot expand and breathe and will cause the plant to become stunted and weak. If you're not sure of your plants requirements, buy a large pot. Now I know that sounds a little vague, so let's get a little more specific about pot size for your plants growing needs. If you plan on growing cucumber, squash and eggplant, for best results choose a pot at least twenty inches in diameter. This also holds true for tomatoes and some, but not all vining plants. Peppers can be grown in a sixteen inch diameter container without the worry of their root system becoming cramped. Shallow root vegetable plants such as lettuce, spinach, radishes and herbs will grow quite successfully in an eight inch container pot. Remember when choosing a container pot, they come in all shapes from a bowl type to cylindrical. Be sure the container you choose has a proportional depth to diameter to accommodate the vegetable plants roots. The three basic ingredients your vegetables require to grow healthy and strong is good soil, proper nutrients to grow, and receive a healthy daily dose of sun. correct pot size, it is important you fill your container with the right soil for your plants. As apartment dwellers don't have a garden outside of their apartment but home owners do, this little tip is for you. Don't roam out into your back yard and dig up soil for your container. Usually the soil is too heavy, has little nutrients your vegetable plant requires, and will not drain properly when watered. More often than not, your backyard soil will also carry microbial disease as well as garden weed seed both of which will discourage proper plant growth. It would be well worth the trip to you local nursery or a garden outlet center to ask a garden expert to help you choose the right soil for vegetables to grow in a container pot. Also, ask him/her what would be the best soil nutrient to use and how often throughout your vegetables growing stage it should be used. 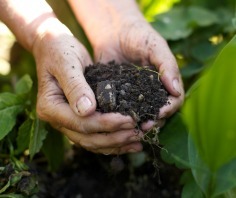 Here are a few things to keep in mind when you purchase good soil. You can use a soilless mix, or soil mix for container vegetable gardening. Consist of peat moss, vermiculite, some coarse sand or a mixture of wood products. It is very light and is worth a thought if you have large containers that need to be moved about frequently so that your plants can get enough sunlight. Usually consists of one part sphagnum peat moss or compost, one part vermiculite or perlite, one part pasteurized soil, and composted cow manure. Oh, don't worry about the cow manure giving off any odor. You can purchase manure that is deodorized at any gardening outlet center. Although not as light as a soilless mix, it does have the advantage to hold water better, therefore, frequency of watering you soil is reduced. Here's another thought worth considering when you're ready to put the soil in your container pots. Put landscape cloth or nylon screen (not metal screen, it rusts) in the bottom of the container to prevent the soil mix from falling through the hole in the bottom of your container. And finally, use mulch on top of the soil to keep it cool and slow down evaporation. Jot down some of these suggestions I made and bring it along with you to discuss with the garden expert so he/she can suggest which method will work best for you. What do we think when we say vegetable fertilizer? Well, the answer should be its food for your plants. gardening. Time-release, and water soluble. Both are required for you vegetable plants to grow healthy and strong. This type of fertilizer should be added when planting your vegetables. For best results I suggest you spend a little time and make sure the fertilizer is thoroughly mixed throughout the soil. Water soluble fertilizer is usually added to the soil somewhere around mid-season of your vegetable plants growing cycle. At around this time most of the soils nitrogen and other nutrients are leached or washed away due to watering your plants. Be sure to ask the nursery expert what is the best type of timed-released and water soluble fertilizer you should use for your soil. I personally favor an organic mixture for my container vegetable gardening soil. I use a granular fertilizer, again taking the time to really mix it in the soil, and that's pretty much all there is to it for the rest of the season. Well, sometime near mid season, I will add a fish fertilizer to compensate for nutrient loss due to watering. If this method of soil mix is of interest to you, ask the nursery expert what organic granular fertilizer he/she would suggest you use. You can use a water meter to check the moisture of your soil or stick your finger into the soil to check for slight dampness. Another method is to use a Popsicle stick. When inserted in the soil and slowly pulled out, if soil sticks to it then the soil is sufficiently moist. Finally, this last suggestion for container vegetable gardening is for apartment dwellers and home owners who wish to grow their vegetables inside their home. If you do not receive at least six hours of sunlight per day for your vegetable plants, then you won't be able to grow fruit plants such as tomatoes. Other vegetable plants that don't do well with an artificial light are cucumbers, eggplant, peppers and green beans just to name a few. However, don't let that stop you. With the use of an artificial light you will not have any problem growing vegetables such as leaf vegetables year-round. These include carrots, beets, radishes, Swiss chard and lettuce. When harvesting time is over, don't save anything. 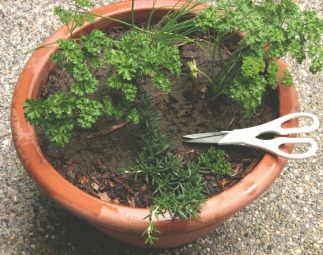 Throw away the entire contents of each pot, and do not reuse the soil for next year's planting. Scrub each container with a solution of ten percent chlorine bleach to water. In closing, a thought crossed my mind. While growing vegetables for you and your family is great, I thought I would include a website you can go to if you grow rhubarb so you can make a delicious rhubarb, pie one of my favorites. If you are like me, you can get more information at savor the rhubarb.com. That said, now you're ready for next seasons planting. I hope you enjoyed this article about container vegetable gardening and found some useful information you can use.